My name is Jovania. I’m 22 years old. I am a student aiming for a BA, majoring in Social work with a Minor in International development. I want to become a diplomat. I was born in Petion-Ville, in Port-au-Prince, in Haïti. I’m now living in Gatineau, a city close to Ottawa in the Province of Québec. I’m a member of many church communities although one of the main parishes where I used to go, and sing at each 8h30 mass for eight years before having to quit for lack of time, was Ste-Rose-de-Lima. Otherwise, I go to the parish close to where I live, Holy Trinity. I’m also a member of the parish of Holy Heart, in Ottawa, where the Haitian community mainly gathers and where I take part in charismatic meetings which help me to feed my faith. 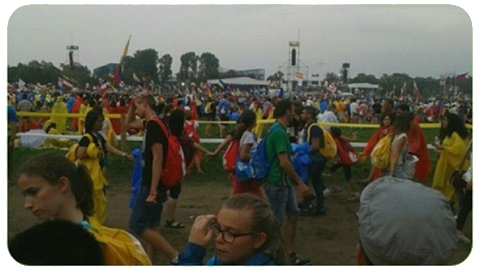 My first encounter with the Eudists is due to the 2016 World Youth Meeting (WYM) that was to be held in Poland. It seems that I have been very lucky. To begin with, the former pastor of my parish, who happened to be a Eudist, had asked me to help him form a group of young people to attend the WYM. Then, the Eudists of France had this bright idea of organizing a preparatory meeting so that all the participants could meet one another. 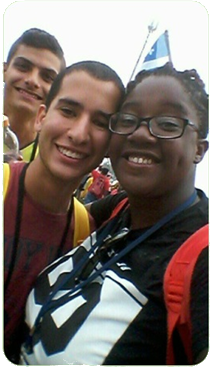 but have given me the opportunity to make friends with many of these young Christians from all over the world. As soon as I was back from Canada, I knew I would meet these people in the future. This is precisely what happened last August when I returned to France. I met my Eudist friends and at the same time, I kept on discovering all about saint John Eudes with the help of a few of the organizers of the WYM such as Alexis Garel, Anne Bonnefis et Aude Bauguin. I am now waiting very impatiently for the WYM that will be held in Panama where I will meet again with the Eudist Family in South America; this will really bring fresh air to my faith.